Hebron is a city in the southern Judea region of the West Bank, 30 km south of Jerusalem. It is home to some 120,000 Palestinians and 600-800 Israeli settlers. Another 7,000 Israelis live in the suburb of Qiryat Arba (or Kiryat Arba) on the outskirts of Hebron. It is famous for its grapes, limestone, pottery workshops and glassblowing factories. The old city of Hebron is characterized by narrow, winding streets, flat-roofed stone houses, and old bazaars. It is home to Hebron University and the Palestine Polytechnic University. 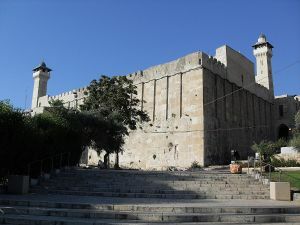 The most famous historic site in Hebron sits on the Cave of the Patriarchs. The site is holy to the three Abrahamic faiths: Judaism, Christianity, and Islam. According to the book of Genesis, Abraham purchased the cave and the field surrounding it to bury his wife Sarah. The cave ultimately became the burial site for Abraham himself as well as Isaac and Rebekah, and Jacob and Leah. For this reason, Hebron is considered the second of the four holiest cities in Judaism (along with Jerusalem, Tiberias and Tzfat). The cave itself, also known as the Cave of Machpelah, is considered the second holiest site in Judaism, and churches, synagogues and mosques have been built there throughout history. It is surmounted by a large mosque, al-Haram al-Ibrahimi al-Khalil (The Sanctuary of Abraham, the Friend). Both Jewish and Muslim services are held there, the tomb being opened to all worshippers following the 1967 Six-Day War, after having been closed to non-Muslims for the previous 700 years. Hebron has been a city of conflict between Palestinian residents and Israeli Settlers and has required the support of the international community serving as a stabilizing, buffering, force. Hebron is one of the most ancient cities in the Middle East, and one of the oldest continuously inhabited cities in the world. Hebron was an ancient Canaanite royal city, which according to archaeological findings was probably founded in 3,500 B.C.E., and mentioned in the Bible as existing during the eighteenth century B.C.E. The Cave of the Patriarchs. Abraham purchased the Cave of Machpelah in Hebron as a burial place for his wife, Sarah, from Ephron the Hittite (Genesis 23). This eventually became the burial place not only for Sarah, but also for Abraham, Isaac and his wife Rebekah, and Jacob and his wife Leah. This site is now known as Cave of the Patriarchs and, according to Midrashic sources it also contains the head of Esau, and to Islamic sources, is also the tomb of Joseph, son of Jacob. Hebron is mentioned as being formerly called Kiryat Arba, Kirjath-arba or Qiryat Arba' (Hebrew meaning “City of the Four”), before being conquered by Joshua and the Israelites (Joshua 14). Hebron became one of the principal centers of the Tribe of Judah. The Judahite David was commanded by God to go to Hebron. He was annointed king there and reigned in the city until the capture of Jerusalem, when the capital of the Kingdom of Israel was moved to that city (II Samuel 2–5). Jar handle stamps bearing Hebrew letters (LMLK seals) dating from 700 B.C.E., the oldest known inscription naming the city, have been found in Hebron. Following the destruction of the First Temple, most of the Jewish inhabitants of Hebron were exiled and their place was taken by Edomites at about 587 B.C.E. Herod the Great built the wall which still surrounds the Cave of Machpelah. During the first war against the Romans, Hebron was conquered by Simon Bar Giora, the leader of the Sicarii. Eventually it became part of the Byzantine Empire. The Byzantine Emperor Justinian I erected a Christian church over the Cave of Machpelah in the sixth century C.E. which was later destroyed by the Sassanids. The Islamic Caliphate established rule over Hebron without resistance in 638. During this period, Muslims converted the Byzantine church at the site of Abraham's tomb into a mosque. Trade greatly expanded, in particular with bedouins in the Negev and the population to the east of the Dead Sea. Both Muslim and Christian sources note that Umar allowed Jews to build a synagogue and burial ground near the Cave of Machpelah. In the 9th century, Zedakah b. Shomron, a Karaite scholar, wrote about a permanent Jewish presence, and a Jewish man was described as the "keeper of the cave." El Makdesi, an Arab historian, described "a synagogue and central kitchen which the Jews had set up for all the pilgrims rich and poor" at the turn of the century. 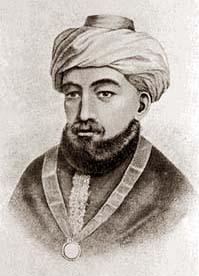 Maimonides established a yearly holiday for himself and his sons, the 9th of Cheshvan, commemorating the day he merited to pray at the Cave of the Patriarchs. "And on the first day of the week, the ninth day of the month of Marheshvan, I left Jerusalem for Hebron to kiss the graves of my forefathers in the Cave of Makhpela. And on that very day, I stood in the cave and I prayed, praised be God for everything." The Kurdish Muslim Salaḥ ed-Dīn took Hebron in 1187, and re-named the city "Hebron." Richard the Lionheart subsequently took the city soon after. In 1260, al-Malik al-Zahir Rukn al-Din Baibars al-Bunduqdari established Mamluk rule; the minarets were built onto the structure of the Cave of Machpelah/Ibrahami Mosque at that time. During this period, a small Jewish community continued to live in Hebron; however, the climate was less tolerant of Jews and Christians than it had been under prior Islamic rule. Jews wishing to visit the tomb were often taxed, and in 1266 a decree was established barring Jews and Christians from entering the Tomb of the Patriarchs; they were only allowed to climb partway up the steps outside the Eastern wall. Many Jewish and Christian visitors wrote about the community, among them a student of Nachmanides (1270), Rabbi Ishtori Haparchi (1322), Stephen von Gumfenberg (1449), Rabbi Meshulam from Voltara (1481) and Rabbi Ovadia mi Bertinoro, a famous biblical commentator (1489). As early as 1333, there was an account from Hakham Yishak Hilo of Larissa, Greece, who arrived in Hebron and observed Jews working in the cotton trade and glassworks. He noted that in Hebron there was an "ancient synagogue in which they prayed day and night." Throughout the Ottoman Empire rule, (1517-1917), groups of Jews from other parts of the Holy Land, and exiles from Spain and other parts of the diaspora settled in Hebron. The city at that time became a center of Jewish learning. In 1540 Rabbi Malkiel Ashkenazi bought a courtyard and established the Abraham Avinu Synagogue. In 1807, the Jewish community purchased a five dunam (5,000 m²) plot upon which the city's wholesale market stands today. Another pogrom took place in 1834. In 1831, Ibrahim Pasha of Egypt took over Hebron until 1840. 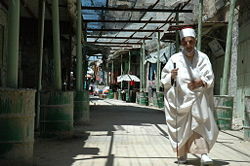 Early in the twentieth century, Hebron was predominately a Muslim Arab city with a Jewish community of about 750. In December 1917 and during World War I, Great Britain occupied Hebron. On August 20, 1929, after Arab attacks in Jerusalem, Haganah leaders proposed to provide defense for the Jews of the Yishuv in Hebron, or to help them evacuate. However, the leaders of the Hebron community declined these offers, insisting that they trusted the A'yan (Arab notables) to protect them. The following Friday, August 23, inflamed by rumors that Jews were about to attack al-Aqsa Mosque, Arabs began attacking Jews in the Old City of Jerusalem. The rumors and subsequent violence quickly spread to other parts of Palestine, with the worst killings occurring in Hebron and Safed. Other murderous assaults took place in Motza, Kfar Uriyah, and Tel Aviv. In Hebron, sixty Jews were wounded while 67 were killed. Eight others died later from wounds suffered during what became known as the "Arab Riots of 1929." Jewish homes and synagogues were ransacked. Most of the remaining Jewish community left the city. Two years later, 35 families moved back into the ruins of the Jewish quarter, but after further riots, the British Government decided to move all Jews out of Hebron "to prevent another massacre." Hebron remained as a part of the British mandate until 1948. 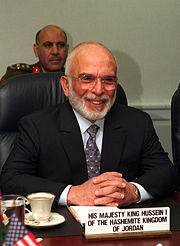 King Hussein of Jordan. Jordan ruled the West Bank from 1948 until June 1967. Following the creation of the State of Israel in 1948, the West Bank and East Jerusalem were ruled by Jordan for a period of nearly two decades, from 1948 until the 1967 Six-Day War. Rather than attempting to establish an independent Palestinian state for its West Bank subjects, Jordan formally annexed East Jerusalem and the West Bank on April 24, 1950, giving all resident Palestinians automatic Jordanian citizenship. Only the United Kingdom and Pakistan formally recognized the annexation of the West Bank, de facto in the case of East Jerusalem. Tensions continued between Jordan and Israel through the early fifties, with Palestinian guerrillas and Israeli commandos crossing the Green Line despite the Jordanian army's efforts to prevent both occurrences. 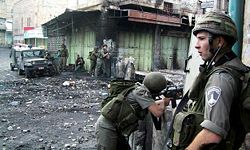 The Qibya massacre, in which an Israeli commando unit killed 50 civilians within the West Bank in retaliation for Palestinian infiltrators' killing of three Israeli civilians, is one of the best known examples. Following the Six Day War, in June 1967, the rule of Hebron changed from Jordanian to Israeli hands. "The government was caught by surprise. Internally divided, depending for its survival on the votes of the National Religious Party, and reluctant to forcibly evacuate the settlers from a city whose Jewish population had been massacred thirty-nine years earlier, the Labor government backed away from its original prohibition against civilian settlement in the area and permitted this group to remain within a military compound. After more than a year and a half of agitation and a bloody Arab attack on the Hebron settlers, the government agreed to allow Levinger's group to establish a town on the outskirts of the city." Levinger's group moved to a nearby abandoned army camp and established the settlement of Kiryat Arba. In 1979, Levinger's wife led 30 Jewish women to take over the former Hadassah Hospital, Daboya Hospital, now Beit Hadassah in central Hebron, founding the Committee of The Jewish Community of Hebron. Before long this received Israeli government approval and a further three Jewish enclaves in the city were established with army assistance. 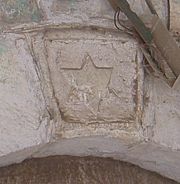 Star of David carved above entrance to an Arab home in the old city of Hebron. The Oslo Accords, officially called the Declaration of Principles on Interim Self-Government Arrangements or Declaration of Principles, were finalized in Oslo, Norway on August 20, 1993, and subsequently officially signed at a public ceremony in Washington, DC on September 13, 1993, with Yasser Arafat signing for the Palestine Liberation Organization and Shimon Peres signing for the State of Israel. U.S. President Bill Clinton, Israeli Prime Minister Yitzhak Rabin, and Russian Foreign Minister Andrei Kozyrev were also present. The Accords were a culmination of a series of both secret and public agreements, dating particularly from the Madrid Conference of 1991 onward, and negotiated between the Israeli government and the Palestine Liberation Organization (acting as representatives of the Palestinian people) in 1993 as part of the peace process attempting to resolve the Israeli-Palestinian conflict. Related to the Oslo Accords were a series of further diplomatic accords. One of these, the Protocol Concerning the Redeployment in Hebron, also known as The Hebron Protocol or Hebron Agreement, took place in January 1997 between Israel, represented by Prime Minister Benjamin Netanyahu, and the PLO, represented by Chairman Yasser Arafat. Supervised by US Secretary of State Warren Christopher, they were an agreement for redeployment of Israeli military forces in Hebron in accordance with the Interim Agreement on the West Bank and the Gaza Strip (the Interim Agreement or "Oslo II") of September 1995. The Hebron Protocol represented significant gains for the Palestinians. Prime Minister Netanyahu betrayed some of his supporters in his Likud party. In reality the Likud was endorsing the notion of "land for peace." The Israelis did gain from the agreement, in the details of the redeployment arrangements and in the right of Jewish settlers to remain in Hebron. Israel did not obtain control of the redeployment's scope, notwithstanding American reassurance. The mostly deserted market in the old city. The Hebron protocol brought in the Temporary International Presence in Hebron (TIPH). This is understood to have been in response to the Israeli terrorist Dr. Baruch Goldstein, who killed 29 Palestinian worshipers in Hebron three years earlier (1994). Thus the Israelis agreed to the Palestinian demand for an outside observer in Hebron. The Interim Agreement had provided that as part of the redeployment of Israeli military forces in the West Bank and the Gaza Strip, there would be the establishment of a Temporary International Presence in Hebron (TIPH). During the period between the conclusion of the Interim Agreement and the Hebron Protocol, the two sides invited Norway to send a group of 50-60 Norwegians to act as an "advance TIPH" preparing for the new TIPH to be established following the redeployment. Under an Agreement dated May 9, 1996, the Norwegian personnel arrived and commenced their operation. When the Hebron negotiations were completed and signed, it also provided that the TIPH would consist of up to 180 persons from Norway, Italy, Denmark, Sweden, Switzerland and Turkey, with Norway being responsible for the coordination of the TIPH's activity. The task of the TIPH was to monitor and report on efforts to maintain normal life in Hebron, to provide a feeling of security among the Palestinians of the city and to help promote stability. In addition, the TIPH personnel were to assist in the promotion and execution of projects, to encourage economic development and growth in the city and to provide reports. The TIPH had no military or police functions. Israeli Police and Army personnel in Hebron during the Second Intifada, November 2000. 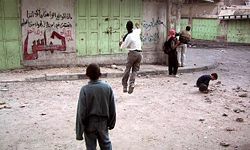 Palestinian youths hurl stones at Israeli soldiers in Hebron, November 2000. Since early 1997 the city has been divided into two sectors: H1 and H2. The H1 sector, home to around 120,000 Palestinians, came under the control of the Palestinian Authority, in accordance with Hebron Protocol. H2, which was inhabited by around 30,000 Palestinians,  remained under Israeli military control in order to protect the 600 to 800 Jewish residents living in the old Jewish quarter, now an enclave near the center of the town. ↑ Encyclopædia Britannica. 2007. Hebron Encyclopædia Britannica Online. Retrieved December 2, 2007. ↑ Randolph Churchill and Winston S. Churchill. The Six Day War. (House of Stratus; New Ed. (original 1967) 2002. ISBN 0755106334), 199 citing "The World at One" BBC radio, July 12, 1967. ↑ Christian Peacemaking Teams. Hebron Update Retrieved December 2, 2007. ↑ Radin, Charles A. July 31, 2002. A top Israeli Says Settlers Incited Riot In Hebron The Boston Globe. Retrieved December 2, 2007. ↑ Alan Sipress. March 3, 1997. Hebron descendants decry actions of current settlers They are kin of the Jews ousted in 1929 Philadelphia Inquirer. Retrieved December 3, 2007. ↑ Tovah Lazaroff. May 16, 2006. Hebron Jews' offspring divided over city's fate Jerusalem Post. Retrieved December 3, 2007. ↑ Meron Rapoport. November 17, 2005. Ghost town Haaretz. Retrieved December 2, 2007. ↑ Karen Koning AbuZayd. October 10, 2006. Palestine Refugees: a challenge for the International Community United Nations Relief and Works Agency for Palestine Refugees in the Near East. (via Relief Web). Retrieved December 2, 2007. ↑ Australian Broadcasting Corporation. March 27, 2002. Two Norwegian observers killed near Hebron, Retrieved December 2, 2007. ↑ Christian Peacemaker Teams. History, Mission of CPT Retrieved December 2, 2007. ↑ Caryle Murphy. October 9, 2004. D.C. Volunteer Finds No Peace On West Bank The Washington Post. Retrieved December 2, 2007. CRW Flags. Har Hebron (Israel, Judea and Samaria/West Bank Occupied Territories). Pasko, Ariel Natan. May 28, 2003. Jerusalemizing Hebron. Arutz Sheva. This page was last modified on 12 December 2017, at 17:37.